Heat oven to 350°F. Grease and flour 9-inch springform pan, or spray with baking spray with flour. In medium bowl, mix flour, baking powder and salt. In large bowl, mix granulated sugar and eggs with mixer on low speed until blended. Add olive oil, yogurt and 1 tablespoon lemon peel; mix until blended. Beat in flour mixture until smooth. Pour into pan. Bake 30 to 35 minutes or until golden brown and toothpick inserted in center comes out clean. Cool cake 15 minutes on cooling rack. Remove side of pan. Carefully poke holes in top of cake with fork every inch. In small bowl, mix lemon juice, olive oil and powdered sugar with whisk until blended. Drizzle cake with glaze. Sprinkle with additional grated lemon peel. Serve the cake with raspberries or blueberries. Variations of this classic lemon olive oil cake can be found in both Italy and Greece. A light and refreshing dessert, it’s best to use a good-quality olive oil whenever possible. And despite being made from scratch, this cake is very easy to make, even for novice home bakers. Made from-scratch cakes like this lemon olive oil cake may seem intimidating at first, and while they do require slightly more work than a boxed mix, they are worth the extra effort and totally doable. 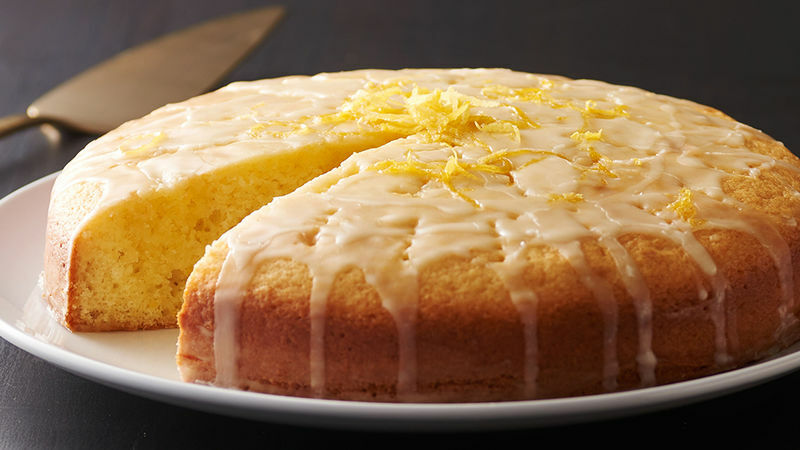 Whereas some lemon cake recipes call for just a sprinkle of powdered sugar on top, this one uses a thin lemon glaze to really amp up the citrus flavor. Serve this delightfully bright dessert, or any of our other amazing cakes, at your next brunch, shower, or special summer gathering.